Larvae feed on many native and introduced legumes (Fabaceae). They are usually attended by ants from three genera, Froggattella, Iridomyrmex and Camponotus. Mature larvae pale green to pinkish-brown with a darker line, body densely covered with small hairs: head brown or black. 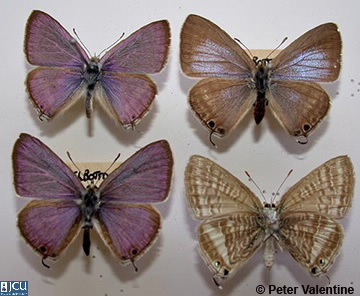 Adult male purplish covered with long white hairs, hind with two eyespots and a slender tail; female pale purple, iridescent, brown towards outer margin, obscure whitish rings and 2 black spots near tail; lower surface pale grey brown, series of whitish spots and bands present, prominent black spots near tail.